Food is the drug of choice for many people. This book helps you examine the dilemma, work through recovery, and maintain that new freedom. For many Christian, food is the drug of choice. 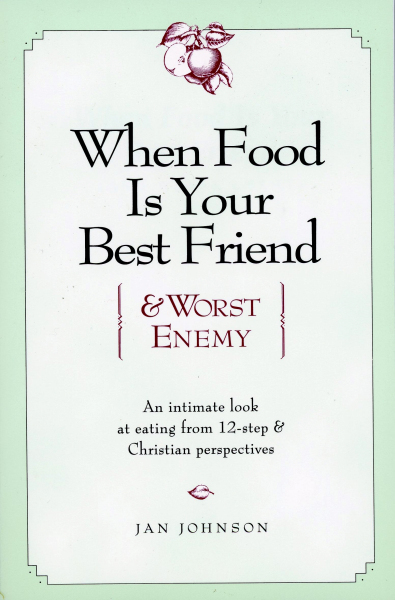 When Food Is Your Best Friend (& Worst Enemy) is an intimate look at why we eat too much from a Christian 12-step perspective. This revealing examination of eating problems offers practical help for Christian and includes personal inventories and exercises. Illustrated with histories (including Jan’s own inner journey as a compulsive eater working toward recovery), this work takes the reader through a three-part journey that defines the situation (What is My Problem? ), points to recovery (How Do I Get Better), and details how to maintain recovery without falling back into old habits (How Do I Stay Better?). The companion devotional, Surrendering Hunger, works well with When Food Is Your Best Friend. Question: If we wanted to use When Food Is your Best Friend for a regular study, how would we do that? What was the most helpful thing you read? What was most difficult for you to read? What topic or issue in the chapter would it help you to hear from others in the group about — how they implemented it or how they dealt with that issue? Rather than being boring, it would help. As participants read the chapter, they’ll start looking for their answers ahead of time and read more attentively. Question: How would I use this book in a weekly study? For guidelines on how to conduct such a study group or a support group, see Appendix A of Healing Hurts that Sabotage the Soul (p. 132).